I moved to the city back in November and although I was so excited about my new apartment, I was pretty nervous to be trading my 13 minute commute into pretty much a full hour long commute. Now, 9 months later I feel pretty confident that I've ~mastered~ my commute... and even began kind of enjoying it! I've put together a list of 10 ways for YOU to master your morning commute and turning it into the most productive hour of your day. First and foremost.... get yourself a good phone mount for your car! I never had one (nor felt the need for one) with my short commute because I didn't need any access to my phone in what was once my short 13 minute drive. However, I quickly realized how useful this little gadget was once I started driving more. It was so difficult for me to find a phone mount that was practical and not bulky, huge, and UGLY. This phone mount from MagnetMount is LIFE CHANGING! It's not huge and bulky and the magnet works so unbelievably well. They also come in super cute and chic colors - silver, black, rose gold, and gold! I don't know how I went so long without one. This is hands down an essential item you need for your morning commute. GET YOURS HERE - there's currently a crazy 60% off flash sale going on!! You can also find them on Amazon HERE! Start your day with an inspiring girl boss podcast. Don't get me wrong, I'll never stop listening to my true crime/murder podcasts... I just started saving those for my drive home ;) I truly believe starting the day with an uplifting an inspiring podcast really sets the tone for your day (and attitude). 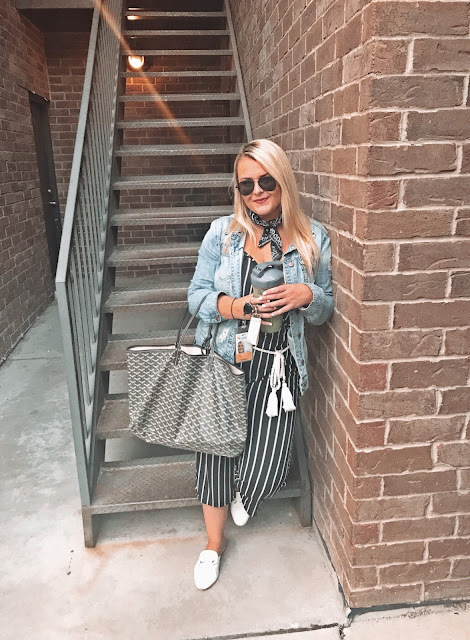 Some of my favorites: His & Hers Podcast by The Skinny Confidential, Girls On The Go (New podcast by my favorite youtubers, Danielle Carolan and Brooke Miccio! ), and Girlboss Radio with Sophia Amoruso. I think of podcasts of this nature to be like my pre-workout but for work. Brainstorm. My best ideas for my blog always come to me late at night when I'm laying in bed or when I'm in the car driving alone. With text capabilities on pretty much any smart phone these days, I definitely utilize this feature to capture any ideas that may spark my brain during my drive. These ideas may come from podcasts, day dreaming in traffic, etc. In fact, the idea for this post came to mind from one of my morning drives. My 'Notes' app in my iPhone are full of random and unorganized ideas, jotted down blog posts, thoughts for weekend plans, etc. Download an audio book. I haven't been reading nearly as much as I want and my list of books just keeps growing. If one morning I'm just not in the mood for a podcast, I'll play one of my audiobooks I've rented. Not going to lie, this got some taking used to. I found it kind of hard to follow along in the beginning with someone reading to me instead of reading for myself. I use the app 'Overdrive', which connects to your local library! Keep your phone charging. This seems like such a no brainer but I can't tell you how many times I've forgotten to plug my phone for the duration of the car ride and after an hour of listening to a podcast, book or what have you, my phone will be at like 75% when I show up to work and that just really annoys me. Having my phone not be fully charged makes me feel like I'm not fully charged and that's no way to start your day, peeps. Mentally plan your day. I always try to make a mental checklist of any tasks/errands I need to complete that day. Whether it be personal errand or for work, making a mental plan of what I need to get done that day really jump starts my morning. For example, do I need to return something to Nordstrom during lunch? Do I need to stop at the bank after work? Do I need to print a return label at work? Go to the post office? Set up a conference call? Get any groceries for dinner tonight? 'Have A Great Day!' playlist on Spotify... you can thank me later. This is hands down the best driving and pregaming playlist. Never at the same time, of course. It is just the best mix of happy-go-lucky oldies mixed with recent hits that puts me in such a good mood. Even at 7am when I am stuck in traffic :-) How you gon' be mad while jamming to 'Come On Eileen'? Make your phone calls. Schedule an appointment. Catch up with your bff who is also commuting. Bug your boyfriend. Call your mom! I find that talking to people in the morning really wakes me up and gets me more excited for the day. It really makes the time in the car go by so quickly as well. These types of phone calls allow my mind to focus on something other than work before I pull into the office. Drink your liquids. I make a smoothie for breakfast every morning (side bar: I just got a Nutribullet and it has CHANGED. MY. LIFE) that I try to drink before I go into the office because I end up forgetting about it when I sit down at my desk and start working. I also try to finish a full Hydroflask filled with water. Sometimes if I'm feeling bold I'll also try and finish my coffee too but then I'm usually sprinting to the bathroom when I get into work cuz.. ya know. Drinking my smoothie and water really helps me wake up and feel energized when I have to start my day of work. Enjoy your 'me' time. I'm a pretty independent person and my alone time is very important. Sometimes it's nice just to not do or think about anything during your drive and just be present with yourself at that moment.There's at least one day a week where I don't feel like using my brain for ANYTHING on my morning drive (usually Mondays.. go figure) and that's ok too. I've been asked several times over the last few months if I'm over my commute yet and truth be told, I really don't mind it. I enjoy catching up with my podcasts, getting some 'reading' done, mentally planning my day, and focusing on myself. What gets you through your morning commute? *MagnetMount: c/o - all thoughts are my own. These are all such great tips!! I listen to podcasts to when I'm in the car! Thanks, Jennifer :) What podcasts are you listening to?! These are amazing tips! Luckily my commute isn't that long but I do love to listen to good music too. That's impressive girl that you commit an hour every day! Props to you! And these are great tips! And using your commute to mentally plan your day is a great idea! This is such a good read, love all these tips, need to implement them in my life. Thanks for sharing these tips. Great, great tips! I really need to get myself a good phone mount! These are great tips. Using commute time to mentaly plan your day sounds interesting. Love that you start your day with a girl boss podcast, that sort of thing always puts me in the mood to tackle the day! Such good tips! I definitely listen to audiobooks to help, but tbh I hate commuting. Americans on average spend 2 weeks of their life in traffic which is crazy! I definitely call the bf but still, wishing I could fly to work is the dream. I wish I could start a carpool group too haha. I know, it's seriously SO crazy how much time we spend in the car - it's frightening!! That's why I want to make the most of my time! A great morning playlist really goes a long way! And yes, audio books makes your commute seem seamless too. Podcasts are everything for a good commute! It definitely makes the the drive go by quicker! Wow an hour commute to work everyday is pretty long but I like how you turned it into a positive. I have never had to travel that far for work before but you have offered up some great tips for handling it if I ever do. Great post, dear! Looks wonderful! Thanks for providing useful information about promotional. Thanks for sharing innovative ideas. These are all such great tips! I think most of them can even be used as ways to help start your day off on the right foot as well. I say that because I don't commute, but am still going to try all of these! Also, I had no idea there was a GirlBoss podcast! I've read the book and seen the Netflix series, so now I'm ready to tackle the podcast! I really enjoyed reading your post. Love your jumpsuit! What an adorable outfit! Wow, that's a pretty outfit! Of course, you look gorgeous!